Showing search results for Broken Heart Quotes, Quotations & Sayings 2019. Being afraid to fall in love just means you've been hurt before and you never want to feel like you're heart has been ripped out again. Love is like a gold. It is very precious yet it can be broken easily by simple acts. Being loved can mend your broken heart. My heart has been broken into bits but I still try to love with the little pieces because hate should never be an option. 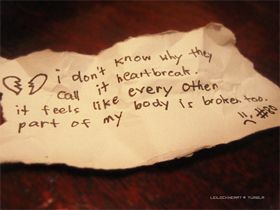 It is difficult to love with a broken heart, love requires a whole heart to be fully expressed. If you believe, you can love again. God takes broken a heart and turns it to a Masterpiece. You only need to find that beautiful person hidden between the fractures of your broken heart to find yourself again.